Visiting the Swedish Norrtelje Distillery to taste their first release of whisky – 6yo organic and sherry matured! On the 7th of July I was fortunate enough to visit the Norrtelje Distillery, situated about 70 kilometers north-east of Stockholm, it lies in the midst of the beautiful Roslagen County. You will find the distillery in the countryside just a few minutes outside of the town Norrtälje. The visit truly turned out to be a VIP tour! Of course I’m not saying I’m a VIP, I’m just saying it sure was a generous tour. As you can see from the pics below I ended up tasting pretty much their entire line-up of products! Before the tasting I was given a very thorough tour of the distillery, from bottom to top, and also, I was able to have a wee chat with Richard (the Managing Director) about anything related to the distillery and the release of their first whisky! As you can all understand it was an absolutely amazing experience! 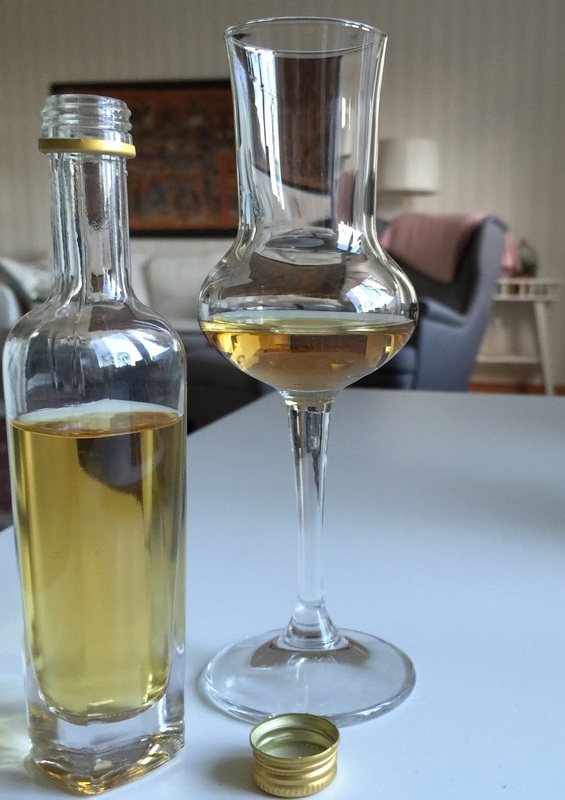 Now, Norrtelje Distillery is Swedens first and foremost producer of distillates made from fruit of all kinds. Some of their products are non-matured and some are barrel-matured. Apart from this they also produce what might be called Swedish calvados (some made from apples and some from pear), the Nordic Arrack liquer called ”Punsch”, AND it is currently one of only three Swedish distilleries producing organic whisky made entirely from Swedish organic barley and organic yeast. Richard also told me that from 1000 kilos of malted barley they end up with around 250 litres of raw-spirit at 40% ABV. But of course, when the raw-spirit that will later become whisky comes out of the spirit still, it holds around 83% ABV and before being filled into casks it is watered down to 60% ABV which then goes into casks for private purchasing (30 litres) or into casks for the distillery to keep for themselves (50 litres and up to 250 litres). The oloroso sherry casks used for this release are both made and rebuilt in Germany. A part from maturing their whisky in oloroso sherry casks, they also use bourbon casks, some are from Jack Daniels and some are from Heaven Hill. For this first release, which is a really small one, only 700, 70cl bottles, have been produced. A couple of hundred of those has been reserved and ordered on beforehand by cask owners, 400 bottles will be released at the Swedish state monopoly this Thursday the 10th of September, and the rest will be brought to whiskyfestivals and the world wide market. The recipe/blend for this particular release consists of whisky from 9 oloroso sherry casks, out of which the majority are 50 litres but some are 30 litres. All of the whisky in this release was laid down in 2009 (now 6 years old) and should therefor rightly be referred to as a vintage release. It has been bottled at 46% ABV. 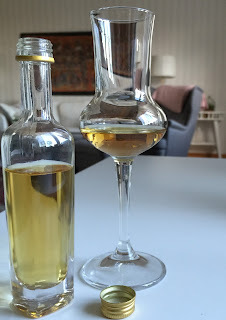 The first release, a 6 yo organic Swedish whisky! Richard added that when it comes to their production of whisky, they don’t really view themselves as competitors to the other Swedish whisky producers/distillers, but rather to act as a complement to the other actors. My personal interpretation of this kind of thinking is that it not only feels like a very humble approach both to other actors but also to consumers. It also indicates that they want to, and in fact do produce a whisky with a completely different style than other actors do. tasting the whisky at the distillery! "I tried the whisky maturing in that cask a couple of weeks ago, and it has developed a fantastic flavor!" Anyways, during my visit to the distillery I did try their first whisky which was about two months before it's release. But at that time I had tasted about 12 (!) of their other products before the whisky, so it was really nice of Richard to let me bring a sample to try at home. So, friends and followers, let's se what this first release from Norrtelje Distillery is like! Holding the glass a couple of centimetres from my nose I pick up a very dry note of sherry, sort of like very dried figs (almost old dried figs), there is also some touches of raisins, both white and dark, they too seem almost old and dry, very sugary. I wouldn’t say that it smells like a first fill sherry cask, rather the second or the third filling. Nosing it really close, with my nose down the glass, I pick up yeast from baking bread, a mix of this and the smell of maturing casks in a warehouse, not strong raw-spirit, but still raw-spirit as one would experience it in the stillroom of a distillery. I wouldn’t say it smells young, rather it’s a whisky with a big touch of breadyeast. There are also quite big whiffs of bitter almond, cinnamon and even cardamom, so a lot of baking stuff going on here. Below this layer I find oven-dried slices of apple, quite big touches of calvados, and finally there is dried lemon peel. Overall I’d describe the nose as hints of sherry cask with quite dry and big acidity. Ok, let’s see what’s on the palate! Yeah! Definitely more sherry influence, and a more classic sherry influence on the palate than what appears on the nose. The first 2-3 seconds it starts off on a mix of sugary sweetness and dry yeast in combo with the very dry (old dried) figs from the nose. When swallowing I quickly pick up wood/cask, not overly boasting oak but a kind of ”thin” cask-y-ness. Immediately after that it moves on into the oven-dried slices of apple, the cardamom is there too, and even some bitter but sweet kind of herbs, there is even som polybody/natures liquorice, kind of green. The aftertaste actually reminds me a lot of the same style as a classic and quite young anCnoc (say something like 12yo)… the aftertaste is thus very palatable and more-ish… Very nice aftertaste. Overall I’d definitely describe the palate as more mature than what the nose indicates. With that said I’d say that the palate seems to have ”evolved” more than the nose. To sum up I’d say that this is a quite different whisky, or maybe the word I’m looking for is unique. Apart from the similarity in the aftertaste to anCnoc, it doesn’t really taste like any whisky I’ve ever tasted. It would be great to see what happens to the nose, and hence the overall impression if this was allowed some more time in cask (say 2-3 more years)! Given the type of stills used, a kind of a mix of potstills and columnstills, and designed for producing fruitdestillate, I would say that this whisky and this particular version doesn’t really deserve to be compared with what has been previously released from the other Swedish distilleries, and I think that people trying this whisky have to approach it with that in mind. This style of this whisky appears to me to be a kind of mix of whisky, fruit-infused whisky with touches of caskmatured grappa, or maybe even calvados-infused whisky, and I really look forward to see what the future holds, and what some more time in the casks would bring!